Automatic “Quick Export” is now available when using tethered shooting, allowing direct tethered -> picasa/facebook/flickr upload. Add error notification when unable to save image settings. Add option to lenses for correcting for fisheye effect. Selectable per lens. Update image while dragging curve points. Cropping can be done by moving single borders. Allowing to de-select a lens in lens editor. Lens Correction cropping is now done without doing actual cropping of the image, faster image display because of that. Overlay scrollbar is disabled, since it makes usability of the iconbar much worse. Olympus cameras read black level from makernote. More precise black/white on Sony A550. More precise white level on Canon 600D/1000D at ISO 100. 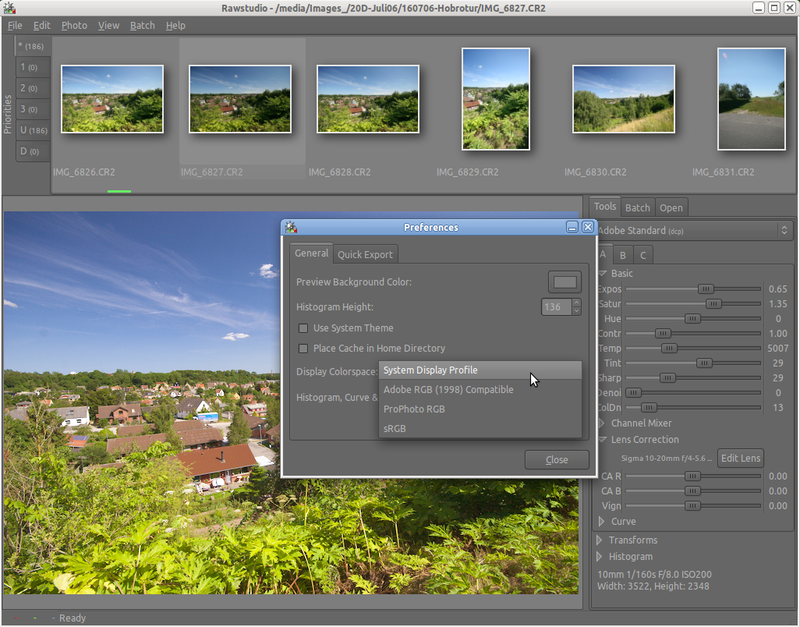 “Quick Export” now properly applies de-noise. Be sure to set camera default when applying settings to previously unopened images. Be sure to reset color profile when changing it. Always add EXIF colorspace info. Fix horizontal scrolling on touchpads. Don’t copy DNG private data tags. Add missing Whitebalance -> Auto to rightclick menu. How can I just accept the preview and export the file(s) to jpeg? I can’t seem to make any of my images as good as the preview no matter what I do. I have a large number of raw shots to process so this would be handy if it can be done. “Quick Export” should of course give you a full-sized export of how the current image looks. It does however not scale the image in any way. Rawstudio uses a “Lanczos” interpolation to scale the image, which is sharper than ordinary bicubic interpolation. This might be why it actually looks better than the exported image. We could add an image size modifier to the Quick Export settings similar to the one in Batch Export. However, since 2.1 Release Candidate is pretty much wrapped up (actually it’s only waiting to upload) it will not be until 2.2 or whichever will be the next version. If you’d like to keep track of how implementation is going, please add it as an enhancement to the bugtracker. I haven’t updated yet but it looks like the minor issues I’ve noticed have been addressed. I’m liking this. Just wanted to say great job and thank you. Great job !! I really like this soft ! When will the PPA be available for Ubuntu 12.04 ?? How do you set system color profile? In Gimp you can choose a monitor profile from disk. I can’t seem to find the rawstudio-2.1.tar.gz file in the /files/release directory. Where are we supposed to download the new source version from?